Having eyes, see you not? and having ears, hear you not? 4th century icon revealed by laser in the catacomb of Santa Tecla (Rome), June 2010. This boyish figure is said by Catholic sources to be the "apostle John." Fat chance. Boiled Alive! 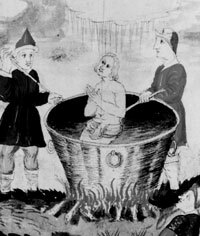  15th century artist shows how a Christian copes with a tub that gets rather too hot! "He [the apostle John] wrote this Gospel in the Province of Asia, after he had composed the Apocalypse on the Island of Patmos". – Eusebius (Hist. eccl., 3.20. 5-7). Earliest known fragment of a gospel (optimistically dated to first half 2nd century). P52 'Rylands fragment'  5 complete & 9 part-words on one side, 6 complete & 7 partial words on the other. If we imagine 79 missing words we can derive a passage found in chapter 18 (verses 31-33 and 37-8) of John's Gospel (or the Gospel of Nicodemus for that matter – see link). This scrap (about 9x6 cm) is used to support a huge weight of traditional New Testament dating. By taking the earliest possible date for P52 – 125 AD rather than the equally valid 150 AD – and then supposing that John was the last of the 4 gospels to be written, the other 3 gospels are pushed back into the 1st century. Convinced? No, nor am I. The John Rylands Library itself currently notes of P52 that "recent research points to a date nearer to 200 AD " (link). And the Gospel of Nicodemus? It seems that propagandists for the anti-Christian emperor Maximinus Daia (305-313) and his Christian opponents both concocted fraudulent "Acts of Pilate" (aka "Gospel of Nicodemus"). Clearly, even in the 4th century, the struggle for "gospel truth" was in full spate. "I do not think that there is one word in the Johannine text that Jesus actually came close to saying." The well-known story of the "woman taken in adultery" – John 7.53 - 8.11 – is a late (probably 5th century) forgery. The passage is not found in any early Greek or Syriac manuscript. An embryonic version of the story appeared perhaps a century earlier, often added into other gospels! Not one of the early Greek fathers commented on the passage, not even Origen and Chrysostom, who wrote commentaries on John's gospel. Which rather makes the familiar "He that is without sin cast the first stone" (8.7) a literary orphan! Perhaps this yarn about forgiveness was too good NOT to put in the mouth of JC himself! Papyrus Bodmer II (P66) has been dated to about 200 AD. It contains the first fourteen chapters of John (but with 22 missing verses) and some parts of chapters 16 to 21.
the highly evolved theology of a Christian writer who lived three generations after Jesus." "Though the central feature of this miracle story, the transformation of one liquid into another, no doubt comes from the lore of Dionysus, the basic outline of the story owes much to the story of Elijah in 1 Kings 17:8-24 LXX"
“What have I to do with you, O man of God?” (Ti emoi kai soi, 17:18). John has transferred this brusque address to the mouth of Jesus, rebuking his mother (2:4, Ti emoi kai soi, gunai). Jesus and Elijah both tell people in need of provisions to take empty pitchers (udria in 1 Kings 17:12, udriai in John 2:6-7), from which sustenance miraculously emerges. And just as this feat causes the woman to declare her faith in Elijah (“I know that you are a man of God,” v. 24), so does Jesus’ wine miracle cause his disciples to put their faith in him (v. 11)." The Gospel of John is a sophisticated deceit, much worked on by a gaggle of fraudsters. But when you tug at the seams the whole fabric of invention unravels. According to the fairy tale, the apostle John lived a remarkable life. At what must have been a very tender age he fell in first with John the Baptist and, soon after, with Jesus himself. Renamed Boanerges (son of thunder) by the godman (Mark 3.17), the dying Christ apparently made him guardian of the Blessed Virgin no less. (What happened to Johns natural mother, one wonders?) Taking his new charge seriously, John re-settled Mary in Ephesus and here faced-down a challenge from the local high priest over a poisoned cup. It was also in Ephesus that John fled the baths, lest the presence of the heretic Cerinthus should cause the roof to fall (or so said Clement of Alexandria!). John became the most active of the apostles, next to Peter, organizing the early church in Palestine and throughout Asia Minor. Sometime around the age of eighty three (the last year of Domitian's reign i.e. 96 AD), he was exiled to the Roman penal colony of Patmos. Uniquely in the history of the Roman judicial system, John survived immersion in burning oil. His jailers must have been so surprised that they provided him with writing materials and he wrote a best-selling 10,000 word horror story (Apocalypse) about the imminent end of the world. Several years later, at a not inconsiderable age, this unlearned ex-fisherman, now a bishop, wrote the beautiful, poetic gospel in best Greek that bears his name. He seems to have died peacefully at his retirement home in Ephesus. In art he is represented by several emblems  he deserves them  among them an eagle and a cooking pot. Then again, maybe all of this is nonsense. "The historical genuineness of the Fourth Gospel is at the present time almost universally denied outside the Catholic Church." Why does almost everyone but a committed Catholic believe that the fourth gospel is a fake?  the duration of Christ's public ministry is extended by John from one year to over three years, during which time John recounts three visits by Jesus to Jerusalem, not just one; within this extended time frame, John moves the so-called purification of the temple, which the synoptics put at the end of the Christ's ministry, to the beginning.  John does not agree with the others on the day of crucifixion  surely an occasion of the utmost import? John says Christ held his last supper with his apostles on Thursday; according to the synoptics, the last supper was on Friday.  While the synoptics focus on the anticipated Kingdom of God (and Christ is Son of Man), John centres on Christ himself, as Son of God and eternal king, and upon the evangelical goal of convincing others that Christ was the Messiah  sentiments more in keeping with an established church.  the long discourses and colloquies of Jesus  remembered so clearly after more than sixty years?  the dogmatic character of John's narrative sits oddly alongside the moral discourses of Jesus in the synoptic gospels.  John's Gospel is the work of a trained mind who wrote good Greek with some semitizing; but Acts 4.13 says that John was illiterate.  John makes little reference to Galilee, which is scarcely what we would expect from a native of the province, especially since Galilee (supposedly) was the centre of Christs ministry. Nor does he mention at all his brother James.  John makes frequent and unnecessary references to the "the Jews", as if they were a hostile group, e.g. "as I said unto the Jews" (John 13.33) said by Jesus (a Jew) to a group of Jews. He was one of them, was he not? John's knowledge of Judaism is also tainted. Critics cite John 18.13 in this regard (as if there were an annual priest): "and brought him first to Annas, who was the father-in-law of Caiaphas, the high priest that year."  The author of this work would hardly refer to himself as "the disciple Jesus loved." 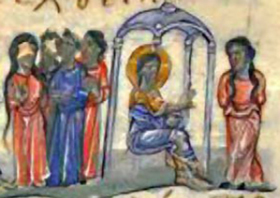 – John does NOT mention the 'Transfiguration' – when supposedly Jesus was joined by Moses and Eliijah (Elias) on a mountain top, transformed into "glory" and was addressed by God himself – an astounding omission considering that we are informed by each of the synoptic gospels that John was one of only three eye witnesses to this stunning miracle! "And after six days Jesus taketh with him Peter, and James, and John, and leadeth them up into an high mountain apart by themselves: and he was transfigured before them. And his raiment became shining, exceeding white as snow; so as no fuller on earth can white them. And there appeared unto them Elias with Moses: and they were talking with Jesus." – Mark 9.2,9. "And he suffered no man to follow him, save Peter, and James, and John the brother of James. And he cometh to the house of the ruler of the synagogue, and seeth the tumult, and them that wept and wailed greatly ... And straightway the damsel arose, and walked; for she was of the age of twelve years. And they were astonished with a great astonishment." – Mark 5.37,42. – Nor does John mention the 'Ascension', one of the crucial events of the whole Christian story. Yet apparently John was a witness to this grand finale whereas the two reporters of the bizarre story (Mark and Luke) were not! "And they rose up the same hour, and returned to Jerusalem, and found the eleven gathered together, and them that were with them, And as they thus spake, Jesus himself stood in the midst of them, and saith unto them, Peace be unto you ... And it came to pass, while he blessed them, he was parted from them, and carried up into heaven." – Luke 24.33,51. If Johns Gospel is only in part a novel re-telling of the Jesus fable, what, then, is it really about? Essentially, it is mid-second century theology written to combat rival, heretical theologies. 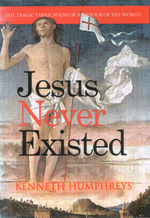 The authors sought not to re-write a Jesus history  they already had several versions of that!  but to define and dogmatise religious ideas and theological speculations and thus call a halt to the free-for-all theorising. "He must increase, but I must decrease. He who comes from above is above all." – John 3.30,31. Again and again, John repeats the message: the divine Word, divine Love, the fullness of his Grace and Truth, and so on. Unlike the pithy, ambiguous sayings in the synoptics, in John, whole discourses are chronicled. These include the famous "I ams" borrowed from the Old Testament (self-referrals by God himself): I am the Redeemer; I am the Light of the World; I am the Way; I am the True Vine; I am the Bread of Life; I am the Lamb, etc, etc. Jesus is elevated to nothing less than eternal co-creator of the universe  beat that, heretic! As evidence of this astounding claim, the writers chronicle many of the miracles by which Christ revealed himself, adding a new one, the raising of Lazarus, not found in the synoptics. The purpose was to establish divinity. Again in opposition to heretics, who tended to reject the (pagan-like) significance of baptism, wine, special bread etc., or regarded them as mere symbols for a subjective psychological state, John stresses these ceremonial aspects (beloved by the hierarchy). Chapters 3, 6, and 15 all stress rebirth in "water and spirit", partaking of the "bread of heaven", of the "true vine," etc. There is a lot of reliance on lengthy discourses which conveniently rebut the claims of heretics. If, then, the fourth gospel is an attack upon heretical ideas, who were the heretics it was directed against? One group were the chiliasts who desperately hoped for divine retribution. Remote from real power, they did not share in aspirations for earthly authority. In the mid-second century, in the Asian province of Phrygia, Montanus (and followers Prisca and Maximilla) were preaching that Johns Apocalypse would descend to earth in Phrygia. Prophecies were collected and in circulation, which they propagated as the word of the holy spirit. Tertullian in Carthage agreed. Another group were the Judaisers, not yet willing to sever ties with Judaism, still less castigate Jews as Christ-killers. These were the Ebionites and Elchasites, who held that Jesus 'was a man of normal birth in whom the spirit of Christ had briefly dwelt'. They rejected Paul as a charlatan and had their own scripture: Gospel of the Nazareans, Gospel of the Hebrews and Gospel of the Ebionites. Irenaeus, the defender of the hierarchy, attacked these advocates of emotional ecstasies which rejected tradition. The Age of Miracles and revelation has ended now the last of apostles dead, declared Irenaeus. He opposed the so-called heretics with a policy of word and sacrament  in other words, a defined gospel and a programme of Church-organised rituals. The earliest complete copies of John do not date back beyond the middle of the fourth century. As to the date of composition we possess no certain historical information. The gnostic language suggests a late date for John, as does the highly developed theology. As we shall see, early Christian writers made no reference to such a gospel, later writers did. Who commented on Johns gospel? John Chrysostom (Bishop of Constantinople, 398 - 403) in his Homilies ; Augustine of Hippo (354 - 430) in his Tractates ; the extant portions of the commentaries of Origen and Cyril. Dionysius of Alexandria (bishop from 247 - 265) knew of Johns gospel but thought it clearly had a different hand from the writer of the Apocalypse. The pagan philosopher Celsus in his True Discourse (about 178) based some of his statements on passages of the fourth gospel and Heracleon, a follower of Valentinius, composed a commentary on the fourth gospel about 160. But a generation earlier, Papias (about 70-130), though mentioning an apostle called John, says nothing of any gospel. Speaking of this Greek Bishop, Eusebius says (Hist. eccl., III, xxxix, 17) his work included passages taken from a first epistle of John but nothing from a gospel. The likelihood, then, is that John went through its various re-writes in the second half of the second century. During this period, the anti-Montanists actually attributed John's Gospel to Cerinthus, an Egyptian heretic. Attribution to a heretic was certainly the fastest way for the hierarchy to discredit a false gospel! The Montanists deduced their doctrine of the paraclete mainly from John 15 and 16. We return to Irenaeus, the Bishop of Lyons, who died about 202. Irenaeus was the first to identify and name the four gospels. This advocate of ecclesiastical totalitarianism (otherwise known as Holy Mother Church) cites in his writings at least one hundred verses from the fourth gospel. It is worth quoting at length Irenaeus's famous document in which he demonized his opponents  Against All Heresies. Afterwards, again, followed Saturninus: Christ had not existed in a bodily substance, and had endured a quasi-passion in a phantasmal shape merely; that a resurrection of the flesh there will by no means be. The resurrection of the flesh he strenuously impugns, affirming that salvation has not been promised to bodies. To these are added those heretics likewise who are called Ophites: Christ, moreover, existed not in substance of flesh: salvation of the flesh is not to be hoped for at all. His soul alone was received in heaven as having been more firm and hardy than all others: whence he would infer, retaining only the salvation of souls, that there are no resurrections of the body. After him brake out the heretic Cerinthus, teaching similarly. For he, too, says that the world was originated by those angels; and sets forth Christ as born of the seed of Joseph, contending that He was merely human, without divinity; affirming also that the Law was given by angels; representing the God of the Jews as not the Lord, but an angel. His successor was Ebion, not agreeing with Cerinthus in every point; in that he affirms the world to have been made by God, not by angels; and because it is written, "No disciple above his master, nor servant above his lord, " sets forth likewise the law as binding, of course for the purpose of excluding the gospel and vindicating Judaism. Christ, moreover, was sent by that First-Father who is Bythus. He, moreover, was not in the substance of our flesh; but, bringing down from heaven some spiritual body or other, passed through the Virgin Mary as water through a pipe, neither receiving nor borrowing aught thence. The resurrection of our present flesh he denies, but (maintains that) of some sister-flesh. they affirm that Christ was not in the substance of flesh; they say there is to be no resurrection of the flesh. To this is added one Cerdo. He introduces two first causes, that is, two Gods-one good, the other cruel: the good being the superior; the latter, the cruel one, being the creator of the world maintains that Christ who came was the Son of the superior God; affirms that He was not in the substance of flesh; states Him to have been only in a phantasmal shape, to have not really suffered, but undergone a quasipassion, and not to have been born of a virgin, nay, really not to have been born at all. A resurrection of the soul merely does he approve, denying that of the body. his assertions are identical with those of the former heretic before him. and thus-the several parts of His body dispersed-He reinstated in heaven His spirit only. This man denies the resurrection of the flesh...He teaches the salvation of souls alone."  Translated by the Rev. S. Thelwall, Christian Classics Ethereal Library. Thus we see that Irenaeus bangs on about an error held by so many Christians, that only a spirit and not the body is resurrected, some thinking Jesus was merely human, others that he was purely divine. His main targets are the Valentinians, active in Ephesus when the Gospel of John saw the light of day. Valentinus  a grand master of esoteric mysteries  had been born in Phrebonis in upper Egypt about 100. Educated in Alexandria by Theudas (a disciple of Paul), Valentinus claimed to possess a secret wisdom  suitable only for the spiritually mature  handed down by Paul to his inner circle. To strengthen his hand, Valentinus also claimed to have had a vision of the risen Christ. Armed with such credentials, around the year 120, he began a career as Christian zealot, working out a cosmological fantasy involving multiple male/female pairs of Aeons  such as Will and Wisdom  all subordinate to the Supreme Being. Christ and the Spirit were another such pair. Despite the intrinsic elitism of Valentinus  he held that pagans were irredeemable, psychics (ordinary Christians) capable of redemption, and pneumatics (like himself!) without need for redemption  he built up a following in Egypt and Syria and, in 136, Valentinus tried his hand in Rome. His major work  The Gospel of Truth  like the fourth gospel, is a work of theology. Ignorance of the Father, said Valentinus, causes agitation and fear, which grow into a fog of error ('a female emanation'!) In error, we commit sin. Knowledge of the Father is salvation; we are eventually restored to gnosis through Christ. This torturous nonsense nonetheless animated the initiates of this popular Christian cult. In response, the ecclesiasta wrote a rebuttal to the theology of Valentinus: the Gospel of John. In short, Johns Gospel was drafted in the 160s as a defining dogma. Having targeted the heresy of Valentinus and kindred groups, it was necessary to backdate 'John' to a more appropriate authorship. Who better than John 1, the delusional author of Revelation? Officially, the target of Johns writing were first century heretics  the Ebionites, the Nicolaites, and in particular Cerinthus. Many other signs also did Jesus in the sight of his disciples, which are not written in this book. But these are written, that you may believe that Jesus is the Christ, the Son of God: and that believing, you may have life in his name  – John 20, 30-31. The twenty-first chapter was added as an afterthought, telling the fishy story about a third reincarnation of the dead lord, the of catching precisely 153 fish, and vouchsafing that we know that the witness he gives is true. (John 21.24). Is John using the 'royal we' here (and also referring to himself as he!) - or is this the voice of the gaggle of second century clerics that wrote the whole fantasy?